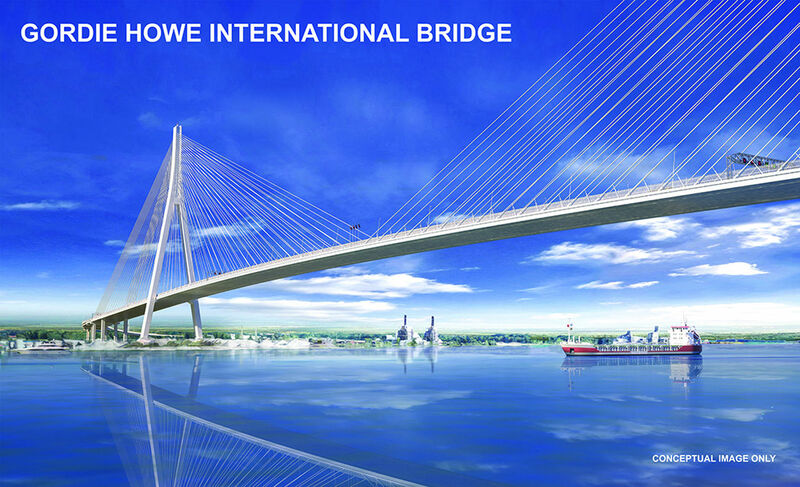 The Gordie Howe International Bridge, a six-lane span between Detroit and Windsor, Ontario, is set to begin construction this fall after the Windsor-Detroit Bridge Authority (WDBA) selected a team to design and build the structure. Bridging North America, an architecture, engineering, and construction ‘whos-who’ team including ACS Infrastructure Canada Inc., Dragados Canada Inc., Fluor Canada Ltd., AECOM, RBC Dominion Securities Inc., Carlos Fernandez Casado S.L/FHECOR Ingenieros Consultores, S.A., Moriyama and Teshima Architects, and Smith-Miller + Hawkinson Architects, LLP, will oversee construction of the $3.7 billion bridge. The WDBA touted the bridge’s benefits in a project update on July 5. The Detroit-Windsor crossing is currently serviced by four separate crossings and accounts for 25 percent of the trade between the U.S. and Canada. Gordie Howe is supposed to streamline entry and exit across both countries for the 2.6 million trucks that make the crossing annually. The 1.5-mile-long span would be the largest cable-stayed bridge in North America and would be supported by two enormous, A-shaped structural towers. 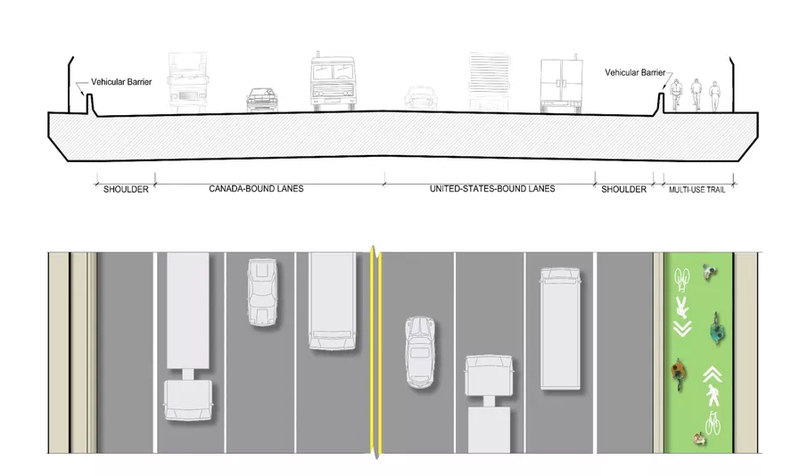 In addition to the six lanes for vehicles, three in each direction, bike lanes have been planned for the side of the bridge facing Detroit. The bridge project includes new ports of entry on both borders and a new connection to I-75. Not everyone is on board with speeding up the flow of goods from Canada. Reflecting the sometimes tumultuous relationship that the Trump administration has had with America’s neighbor to the north, owners of the nearby Ambassador Bridge, the Moroun family, are reportedly trying to kill the project. The Ambassador Bridge currently handles 60 to 70 percent of truck traffic across the Detroit River, and the Canadian Government, owners of the WDBA, have stipulated that the Ambassador Bridge will need to be torn down once the Gordie Howe is complete. In response, the Morouns have been buying commercial airtime on Washington, D.C.-area Fox News stations in an attempt to influence Trump to scrap the Gordie Howe. The family has also been trying to get the Trump administration to inject the Gordie Howe into NAFTA negotiations and to pressure the Canadian government to drop its requirement that the Ambassador Bridge be dismantled. The Morouns are also fighting to keep the Michigan Department of Transportation from using eminent domain to acquire the land it needs to build a 167-acre port-of-entry in Detroit’s Delray neighborhood. The WDBA is still negotiating contract details with Bridging North America, and if everything proceeds as planned, work on the Gordie Howe should begin by the end of September.